AnswerGarden is an easy-to-use online feedback app that can be used to elicit brief answers from your respondents. It adopts a minimalist design that allows users to create, share, answer, and manage topic questions without signing up for accounts. Although a simple app, it has the potential to be used to accomplish a wide range of education tasks, such as brainstorming, polling, synchronous and asynchronous communication, and formative assessment. For example, a math teacher can post a warm up question to activate students’ prior knowledge, as shown in the picture below. AnswerGarden can be used with devices with internet access. It offers no accommodation for people who are visually impaired. Substitution: Teacher posts the question, “What are the synonyms for ‘happy,’ on AnswerGarden and sends the link to students. Students click on the link to add their inputs. Augmentation: Over the course of two weeks, students keep finding and adding synonyms for happy while reading books of their choices. 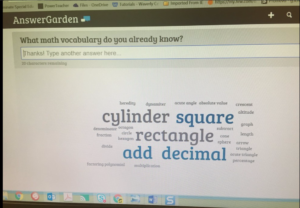 Modification: Every other day, students review the answers in their AnswerGarden page and analyze new words added by their peers which were not known to them previously. Redefinition: The class can invite another class from another country to join their activity. They can be peer tutors and teach these words to the students from the other country. Click on Create New AnswerGarden, or click on the addition sign, as shown in the picture below. In Brainstorm Mode, respondents can submit an unlimited number of answers, including unlimited copies of the same answer. In Classroom Mode respondents can submit an unlimited number of answers, but may only submit each answer once. In Moderator Mode each answer will be submitted to the AntiGarden, so you can manually approve these entries to your AnswerGarden. In Locked Mode the AnswerGarden is closed and no new answers can be submitted. Spam Filter: The spam filter option detects and blocks ‘common unwanted answers’. These include a range of swearwords in the English and Dutch language. Copy the link to your AnswerGarden and email it to your audience. Click on “share” at the bottom of your answer “garden.” You can now share your question on Facebook, Twitter, and other social medias. The “Share” function also allow you to place (embed) your AnswerGarden on your blog, site or social network page, using the provided embed code. Choose the “Moderator” mode. All the answers will then be sent to an AntiGarden. The AntiGarden has the same setup as the AnswerGarden, except that the question will be red, and the administrator needs to approve the answers manually to enter into the AnswerGarden. Turn on the Spam Filter while creating the question. Remove unwanted answers by click on an answer and click on the X. You can undo the removal by logging in as administrator, clicking on “moderator” at the bottom of your AnswerGarden, logged in as Admin and click Moderate button underneath your AnswerGarden. You can now click each answer to select it and reveal a green approve-button (with a white check) next to the answer. Simply click the approve-button and the answer will be removed from the AntiGarden and moved to your AnswerGarden. The AnswerGarden will not show answers in their entirety. Only the essence of the answers is displayed in the “garden.” The words towards the center of the “garden” are the high-frequency words in all the answers, the ones towards the edge of the “garden” are words repeated less. Clicking on a word can reveal how many times the word is used in the answers. As shown in the picture above, the word “chocolate” was used three hundred forty-seven times in the answers.